If Jean Alesi starts all 17 Grands Prix in 2001, he will surpasss the total of 199 Grand Prix appearances of his friend and team boss Alain Prost. In 2001, the French-Sicilian will be determined to achieve much more than he achieved in 2000. Of the current Formula One drivers, he is by far the most experienced. Yet after 184 Grand Prix starts, one win, sixteen second place finishes, fifteen third place finishes, two pole positions, four fastest laps, 267 laps led and 236 Championship points, Alesi has become one of the sport's greatest underachievers. An analysis of the teams he has driven for in his 12 year Formula One career helps to account for this. 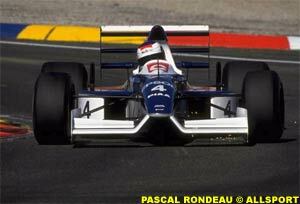 The 1989 French Grand Prix saw the spectacular debut of Alesi, driving for Tyrrell. 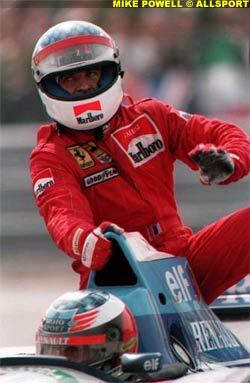 A richly deserved 4th place heralded the arrival of a rising star, many seeing him as the next Alain Prost. Performances at Phoenix and Monaco the following season made him the driver every Formula One team wanted to sign, particularly after his memorable dice with Ayrton Senna at Phoenix. At one stage in 1990, he was rumoured to have signed contracts with Tyrrell, Williams and Ferrari. Prior to the Portuguese Grand Prix, it was announced that he would partner Alain Prost at Ferrari in 1991. Alesi spent 1991 through 1995 with the legendary Italian outfit. While he still has many happy memories of this phase of his career, it proved to be a frustrating time for him. After five years, he netted his one and only victory to date, at the 1995 Canadian Grand Prix. Worse still, in his 79 outings for the Scuderia, 29 were halted due to mechanical failures, a staggering 37%. Bad luck, in addition to mechanical unreliability, have been key themes of his Formula One career. Disillusioned and frustrated, having made amazing efforts for the team, making do with whatever he was given to drive, Alesi left for Benetton for 1996 and 1997. His move to Benetton gave him what many felt was a realistic opportunity to challenge for the World Championship. However, the Benetton dream soon turned into a nightmare. The B196 was not to the liking of Alesi, or teammate and fellow Ferrari refugee Gerhard Berger, with the team seemingly numbed following the departure of reigning World Champion Michael Schumacher. Neither driver managed to win a race in 1996, although Alesi came close in Monaco, and Berger came within 3 laps of victory at Hockenheim, both halted by mechanical failures. The previous season, Schumacher won nine times with teammate Herbert winning twice. Benetton technical Ross Brawn said of the B196: "We haven't yet quite given them (Alesi and Berger) a car they can really get into, so we haven't really seen the best of them." As the season progressed, Alesi's friendship with Benetton supremo Flavio Briatore began to sour. 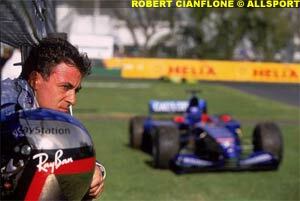 Reliability, the unfortunate buzzword of Alesi's career, was again an issue at Benetton. The B196 failed eight times in sixteen races in 1996 (two for Alesi and six for Berger), compared with two mechanical failures for its predecessor the B195, in seventeen races in 1995 (one each for Schumacher and Herbert). While Benetton reliability was excellent in 1997 (only one mechanically-related failure - Alex Wurz in Canada), the B197 was generally uncompetitive and rarely worked well in qualifying. Berger won for Benetton at the German Grand Prix, while Alesi's high-point was his pole at Monza. After much frustration and false hope at Benetton, Alesi signed for Sauber for 1998 and 1999, largely due to the influence of Gerhard Berger who helped secure the drive. The Frenchman described his time with Sauber as "a reset of my Formula One life". The 1998 season saw him achieve some excellent results, particularly his 3rd place in the rain-soaked Belgian Grand Prix. Other high points included 5th places at Argentina and Italy, in addition to securing Sauber's first ever front row qualification for the Austrian Grand Prix. Many expected that Alesi's career was nearing its end and that his best days were long past, but Alesi showed this was not the case. If anything, he was better than ever in 1998, proving his ability in relatively uncompetitive equipment. While the Sauber C17, with its 1997 specification Ferrari V10 was generally reliable, it was never a consistent front-runner. On the basis of 1998, expectations were high for 1999. Sadly, it was another case of false hope for Jean Alesi. The Sauber C18 was unreliable, particularly in the transmission department. The 1998 specification Ferrari V10 was powerful, but the car did not work well in qualifying. Following his retirement from the Hungarian Grand Prix, he announced that he was quitting the Swiss outfit. Two weeks later, he announced his move to Prost Grand Prix. Despite a poor season in terms of results, Alesi still exhibited star qualities, examples included his front row qualification for the French Grand Prix and his passing of 14 cars within 19 laps in Brazil, before being halted by transmission failure. The 2000 season at Prost proved to be a fruitless one. For the first time in his Formula One career, Alesi failed to score a point. 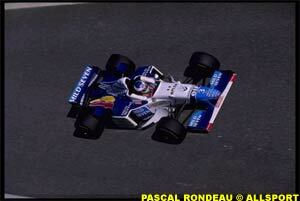 The AP03 was extremely unreliable, with the team making its way through 54 Peugeot V10 powerplants during 2000. The Peugeot Sport A20 V10 was hopelessly uncompetitive largely due to a design philosophy of the small bore/long stroke configuration, which dated back to Peugeot's Le Mans challenges of the early 1990s. Despite such a torrid season, Alesi was better than ever. He put together probably the most spectacular qualifying lap of the year when he qualified 7th at Monaco in a car which turned out to be the worst on the grid, as Prost finished last behind Minardi in the Constructors' Championship. Other moments of inspiration included his charge from 17th to 9th in Canada and his rise to 4th for much of the Belgian Grand Prix, following an inspired early change to slicks in a rain-affected event. Sadly, both these great drives were cut short due to mechanical failures - something he has become accustomed to in 12 years as a Formula One driver. Although his career has been hindered by bad luck and a series of unreliable, uncompetitive cars, he has never given up driving flat-out or given every second behind the wheel of a Formula One car less than 100% commitment. His situation is similar to that of Chris Amon, probably the greatest driver never to have won a Grand Prix. Both men have had the misfortune of being in the right team at the wrong time. It could have been totally different. During the course of 1990, he had the option of signing for Williams, but his love of Ferrari and its Italian heritage caused him to let his heart rule his head. With Williams, it is likely that he would have won many more races and probably Championships. It also must be frustrating for Alesi to see how Michael Schumacher has won 25 races for the Scuderia including the 2000 World Championship, in the five years since Alesi's departure. For Alesi, one win with Ferrari seems unjust reward for his Herculean efforts for the Scuderia in a similar period of five years in a series of cars that were not in the same league as those that Schumacher has had at his disposal, except perhaps for the 1996 F310. In addition, from 1991 to 1995, Ferrari cars suffered 58 mechanical failures in 161 car starts, a 36% failure rate. This compares with the 5 years since Schumacher joined in 1996, when Ferrari cars failed 24 times in 163 car starts, a 15% failure rate. It is worth remembering that Alesi joined Ferrari as a winning team in 1991 and saw its performance slump until 1993, then with Gerhard Berger and Jean Todt, helped develop the team during its renaissance of 1994 and 1995. When Michael Schumacher arrived in late 1995, Ferrari was in a much healthier state than it was three years before. In addition, for 1996, the Scuderia dispensed with the unreliable, thirsty and heavy V12 engine and replaced it with a powerful and reliable V10 (something Alesi never enjoyed the benefit of during his five years with the Italian outfit), which helped Michael Schumacher to his 25 victories since 1996. In hindsight, Alesi will feel that his departure from came at the worst possible time. Despite a career to date which has failed to see him achieve greater levels of success, the French-Sicilian enjoys being a Formula One driver more now than he did when he first raced in 1989. Alesi has given sufficient evidence to show that he is one of the most naturally-talented drivers in the history of the sport. There have been many amazing examples of his dramatic abilities. His dice with Senna at Phoenix in 1990, the battle with Nigel Mansell for 3rd place in the 1994 Japanese Grand Prix, his outstanding drive in the 1992 Spanish Grand Prix starting from 8th on the grid and finishing 3rd in a rain-soaked race, displaying a masterful levels of car control and bravery en route. However, for many, Alesi's greatest race performance came at the 1995 Japanese Grand Prix. Starting on the front row for a wet race, Alesi received a 10 second stop-go penalty for jumping the start. He charged back through the field, then pitted for slicks. Following this, he began a charge through the field, dramatically spinning while attempting to pass a Minardi, falling back to 15th place, then set about passing everything in front of him in a truly spectacular fashion exhibiting breathtaking displays of car-control. He rose to 2nd, and gave race leader Michael Schumacher and the Benetton team much to worry about. It seemed that Alesi could catch and pass the German, but after 24 inspiring laps, Alesi's Ferrari 412T2 coasted to a halt with transmission failure. It was a spectacular drive which those witnessed will never forget. Alan Jones, 1980 World Champion, said of Alesi's performance, "That will go down as one of the great drives in Grand Prix racing." 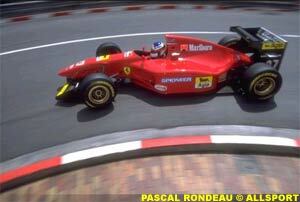 Aside from individual race performances, Alesi's talents are wide-ranging. His head-down, hard-charging style has gained him legions of fans throughout the world. In wet or mixed conditions, Alesi can be relied upon to put together inspirational displays of driving, generally keeping the car on the road. Former adversary Martin Brundle acknowledged the French- Sicilian's ability with his contention that : "His car control is the finest in the world bar none." Alesi's legendary bravery behind the wheel of a Formula One car is the characteristic which best sums up his approach to Grand Prix Racing. At a time when most of the current group of Formula One racers are more concerned with computer games than with spectacular, daredevil driving, Alesi represents a braver breed of racer more in keeping with greats of the past such as Tazio Nuvolari, Gilles Villeneuve and Ayrton Senna. Of his many racing skills, Alesi's legendary starts epitomize his true greatness. Some examples include Phoenix 1990, Spain 1992, Britain 1995, Italy 1996, Monaco 1998 and Britain 1998. But perhaps his most spectacular start came at the 1993 Portuguese Grand Prix. Starting from 3rd on the grid, Alesi passed three World Champions going into the first turn, Prost, Senna and Hakkinen, to lead the race for 19 laps, a position a Ferrari had not held since Alesi himself led for part of the 1991 Belgian Grand Prix. On a personal level, the French-Sicilian is of an emotional disposition, often wearing his heart on his sleeve. Perhaps the best example of this is his retirement from the lead of the 1994 Italian Grand Prix, which was probably the biggest disappointment of his Formula One career. Filled with rage and disappointment, he drove directly from the circuit in his Alfa Romeo 164, destined for his home at Avignon, still wearing his race overalls. He completed the journey in a time that shattered his previous best! Aside from emotion, honesty, frankness and loyalty to family and friends are the main character traits of Jean Alesi. Though considered temperamental, he was the unifying force at Prost in 2000, which allowed the cliques within the team to work together with a semblance of civility. Alesi's critics will argue that his emotional nature tends to get the better of him. However, it didn't seem to be a problem when he won the 1989 Formula 3000 Championship with Eddie Jordan Racing. In addition, other detractors will contend that Alesi cannot adequately develop a Grand Prix car. Ross Brawn, Technical Director at Benetton in 1996 would disagree : "He gives good information on the car in his own way. It's different, but all drivers are different." Joan Villadelprat, incoming managing director at Prost, and former Benetton operations director, said of Alesi, : "If Jean gets into a car he is comfortable with, he is as quick as any." Alesi, in common with Nigel Mansell and Keke Rosberg, tends to drive around a car's handling problems rather than spend lengthy periods adjusting set-ups. This characteristic, however, did not prevent either Rosberg and Mansell from becoming World Champion. After 12 largely unrewarded years as a Grand Prix racer, particularly the 2000 season, Alesi will be hoping for a successful 2001 with Prost. With 2000 specification Ferrari V10 powerplants, in addition to Michelin tyres and a restructured Prost outfit, he has every reason to be cautiously optimistic. In addition, Alesi sees the arrival of Joan Villadelprat to Prost as managing director as a move which has already paid dividends. While Alesi will not be fighting for the World Championship, he will be looking at regular points finishes, an occasional podium and perhaps a race win. In wet or mixed conditions, or if the 2001 AP04 is even vaguely competitive, he will achieve much. Beyond 2001, many feel that the most flamboyant driver in Formula One might retire. If he were to retire, his absence from the sport would leave it all the poorer. However, if he were to have a successful season with Prost, he could remain there for 2002 and beyond. During 2000, Alesi expressed an interest in the American CART series, which could provide him with a meaningful outlet for his racing talents, in an arena where the driver is concerned with beating other drivers rather than beating other racing machines. However, Alesi's racing career could yet end on a high note. Prior to the 2000 British Grand Prix, former manager Eddie Jordan paid a glowing tribute to the French-Sicilian : "If I had one regret it is that I haven't worked with Jean in Formula One, because I honestly believe that I could have turned him into the World Champion that he should have been." In 2002, Jordan Grand Prix will probably have one, possibly two, vacant seats, by which time the Irish team with its works Honda V10 should be able to challenge for the Championship. Who better to lead such a challenge than Jean Alesi, who under Eddie Jordan's management in 1989, became that year's Formula 3000 Champion. For 2002, Eddie Jordan will be free to do what he failed to do in the past, and perhaps help Alesi to achieve his ultimate ambition; to become Formula One World Champion.